One of the most important factors in maintaining a healthy aquarium or pond is performing water changes on a set schedule. Depending on who you ask, you can get a response of 25% monthly to 90% daily. What is not understood widely is why water changes are important and what you are accomplishing when you do one. There was lot of bad information written about water changes in the past and still being written today. With this article I hope to clear up some common misconceptions, and quantify how much and how often a water change should be made. When drawing water out of the aquarium, remove the water from mid-column. Never gravel vacuum an aquarium that does not use an under gravel filter, as this upsets the ecological balance of the bed and can lead to dangerous ammonia and nitrite levels a few days later. Why is old water a bad thing, and how do you know when your water is old. Water out of the tap normally has 0 ppm ammonia, 0 ppm nitrite, and 0 ppm to <4 ppm nitrate. 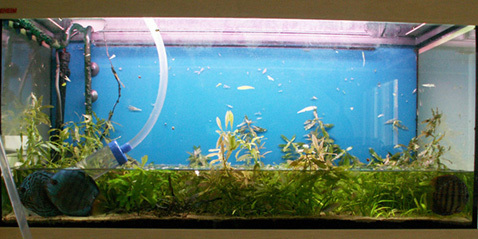 In an "established" (established = completed the nitrogen cycle) aquarium or pond nitrate levels tend to rise over time. How fast nitrate accumulates is highly variable. Nitrate is formed by the bacterial action on waste from the animals, and the decomposition of decaying plant matter. The aerobic bacteria known as Nitrosospira and Nitrospira, help break down the waste in an aquarium or pond from ammonia, to nitrite, and then into nitrate. If you have a heavily stocked tank or pond your nitrate level can accumulate very quickly. Aquariums and ponds can be designed to slow down the accumulation of nitrate by having live plants, deep sand beds (DSB), refugiums (with DSB and Macro Algae), algae scrubbers, or a denitrator filter. If you have none of these nitrate reducing elements in your tank or pond ecosystem, the nitrate can accumulate very quickly. If you have two or more 10 inch (25 cm) Oscars (Astronotus ocellatus) in a 50 gallon (190 l) aquarium your nitrate levels will accumulate very quickly. A 25% water change monthly will not be sufficient, and will likely lead to a condition know as "Hole In The Head" (HITH) disease, common in Oscars because of the great amount of nitrate that accumulates in tanks with these large fish. The quantity of nitrate in the system determines when your water is old. The lower your nitrate level the better it is for your fish and invertebrates. All species of fish and invertebrates have a different tolerant level to nitrate. How Much Nitrate is Safe? An aquarium and pond myth that is floating around that says Nitrosomonas and Nitrobacter breakdown ammonia and nitrite in an aquarium/pond. There are a lot of aquarium products that are produced by many aquarium product manufactures based on this myth for seeding new tanks and ponds with good bacteria. These products do not work because they do not have the right bacteria. The right bacteria is Nitrosospira and Nitrospira, and as of this writing, I only know of one refrigerated product called "Bio-Spira" produced by Marineland that contains the correct bacteria that does work. An aquarium and pond myth that is floating around says not to do a large water change as this removes to much beneficial bacteria that breaks down the ammonia and nitrite. This is not true. Beneficial bacteria that breaks down ammonia and nitrite live on surface area within the tank/pond and filtration system, it does not live in the water column. That is why many filters on the market today have some sort of biological filter media, like Bio-Wheel filters, trickle filters, sponge filters, canister filters with bio-media. These types of filters have large amounts of surface area for nitrifying bacteria to colonize. "pH Shock" in fish has visible symptoms. Fish that exhibit pH shock will lay on the bottom of the tank, often on their side, and will be breathing abnormally heavy. This condition can be reversed provided you return the fish to pH level it was adapted to. It can take the fish several days to recover, so if you put the fish in a tank that has fish, make sure you isolate the fish either in a plastic critter container or a hang on the tank breeder net. Fish with pH shock are not very mobile and can easily be picked on and killed by other fish in the tank. Most freshwater and marine fish can tolerate short term exposure (less than 2 weeks) to 100 ppm nitrate, but any higher long term exposure (greater than 2 weeks) can cause health problems with sensitive fish like Purple Tangs (Zebrasoma xanthurum). My current recommendation for maximum nitrate level for fish is 100 ppm. In reef aquariums where Clownfish "Host Anemones" are kept, my recommendation is below 20 ppm nitrate. How much water to change and on what type of schedule will depend on the bio-load of the aquarium or pond, and any nitrate reducing factors you have implemented, if any. In some well established reef aquariums that have low bio-load and use DSB, refugium, denitrator, and or algae scrubbers it is not all that uncommon for nitrate levels to accumulate very slowly, or not at all. In a reef aquarium where nitrate levels are undetectable I recommend at lease a 50% water change once every 6 months to replace any minor trace elements that may be used up by the reef inhabitants. Marine fish with Marine Head and Lateral Line Erosion (MHLLE or HLLE) can have their condition reversed if they are moved to a tank that is able to maintain it's nitrate below 40 ppm. Most aquariums and ponds are not able to maintain low nitrate levels. When ever you do a water change it is recommended that you change out at least 50% at a time to reduce the nitrate by concentration by 50%. In general the percentage of water you change is equivalent to the percentage of nitrate reduction. If your nitrate level is 100 ppm and you need to get it down to below 20 ppm to keep that anemone you have wanted to get for your Clownfish, you need to do at least a 80% water change to get it down below the target level. Two 40% water changes will not get you down to <20 ppm, it will only get you to 36 ppm. In most cases the larger the water change you can do the better, with one exception. 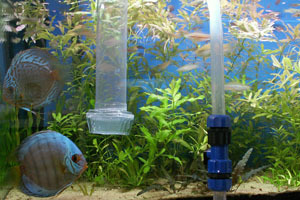 Aquariums with high nitrate levels often have a low pH. A large water change on an aquarium with a low pH can cause fish mortality within 24 hours from condition known as "pH Shock". When large quantities of water are replaced in an aquarium this often results in an increase in pH. In systems that have strong buffering like marine aquariums, the risk of pH shock is not as great as with freshwater. Soft freshwater has a poor buffering capacity, so make sure before you do a large water change, check the pH. In this case several small water changes (25%) over several days to slowly bring up the pH before a large water change is done will help the fish adjust to the higher pH slowly. You should test your nitrate level after you have done a water change to find out what level the nitrate is at, and make a note of the date and concentration. One week later check the nitrate level again and subtract the nitrate reading you took after the water change from the nitrate reading you have now. If your nitrate accumulated 20 ppm in that time you have an idea of how fast it accumulates in your tank. In this case if you started with 20 ppm nitrate, you have 4 weeks before your tank reaches 100 ppm, at which time you should do at least an 80% water change to get at or below 20 ppm. When I do a water change on my tanks or pond, I drain the water down to just enough to give the fish enough water to keep them wet, and then I fill it back up with de-chlorinated water. Aquarium Pharmaceuticals liquid nitrate test kit is a very popular test kit, because it is very easy to use. The instructions that come with the test kit say to shake bottle #2 30 seconds. If you shake bottle #2 only 30 seconds you are likely to get a false low nitrate reading. I recommend you shake the bottle #2 for two minutes before adding it to the test sample to get a true reading of your nitrate content. I have seen a lot of reef hobbyist have problems with their tank because their nitrate was really off the chart when the test (following the instructions) showed near 0 ppm. The main reason behind water changes is nitrate reduction. Most Freshwater and Saltwater Master Test Kits come with a nitrate test kit, but they can also be purchased separately. I recommend that you check the nitrate at least once a month, and before and after water changes so you can get an idea on how fast nitrate accumulates in your system. Nitrate test kits come in powder, liquid, and test strip forms. My personal preference is the liquid test kits. They are easy to use and are accurate enough to make a good estimate on how often you should make a water change and how much you need to change. If you are testing your nitrate for the first time you may be surprised that your nitrate level is off the scale. To get general reading in this case for freshwater you will need to cut 1 part sample water with 3 parts of tap or distilled water (or a known water source that has 0 nitrate), and for saltwater you will need freshly mixed saltwater with a nitrate level of 0 ppm. Once you have completed the test and have a legible reading, multiply the result by 4 to get the true reading. You may have to cut the sample water even more to get a reading. On several occasions sample water I have tested had to be cut by 20 times to get a legible reading. Never do a heavy gravel vacuuming on an aquarium that does not use an Under Gravel filter. This can upset the ecological balance of a sand or gravel bed causing an ammonia and nitrite spike a few days later. Water changes are the key to long term health of a closed aquatic environment. Nitrate reduction through water changes is a must for most closed systems. Put your nitrate test kit to work to monitor the overall health of the closed system. When you do your water changes remove the water from the water column, and try not to disturb the sand or gravel bed to much, as this can lead to ammonia and nitrite spikes a few days after.